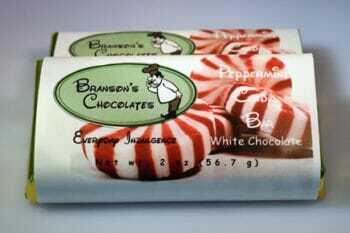 December is the perfect month for peppermint everything, and at Branson’s Chocolates that means Peppermint Squares, White Chocolate Peppermint Bars, and Gourmet Semi-Sweet Peppermint Bars. Our delicious Peppermint Squares have a layer of rich dark chocolate topped with a layer of smooth white chocolate and crushed peppermint candy. Our scrumptious White Chocolate Peppermint Bars mix peppermint candies and a touch of locally sourced peppermint oil right into the white chocolate. 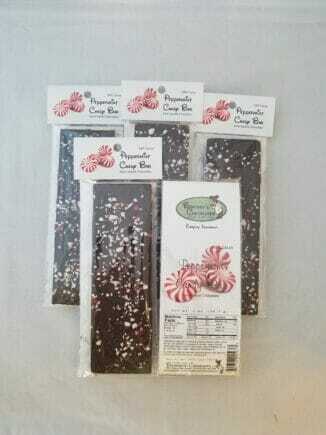 And our Gourmet Semi-Sweet Peppermint Bars have crushed peppermint candies stirred into the rich dark chocolate with even more sprinkled on top. Naughty or nice, you deserve some, so come in and pick up some for yourself. 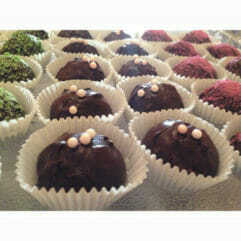 The holiday season is fast approaching, so now is the perfect time to come in and order chocolate for the holidays. 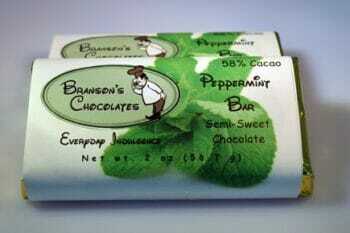 Branson’s Chocolates, your home for peppermint everything (and chocolate too!) is right here in Ashland at 1662 Siskiyou Boulevard. We’re just a block south of 7-11, next to Abbey Carpet Mart. We will be creating chocolate deliciousness at our shop all month long, so come on in and treat yourself. Buy chocolate for someone else too and you’re sure to end up on the ‘Nice’ list! We’re open Monday – Saturday 10-5:30. If you have ever wondered what exactly a Truffle is, or what different flavors of chocolate bars we sell, this series will provide all of the answers to your questions. Over the next couple of months, I will be writing separate blog posts as part of a series on the different types of confections we offer including Truffles, Cremes, Chocolate Bars, etc. To read our post about Truffles, the first installment in this series click here. 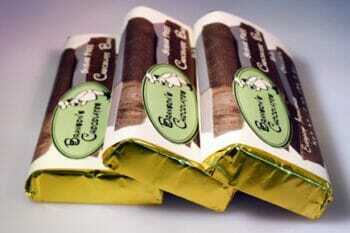 Today we will be talking about one of our best selling products; Chocolate Bars! So what exactly is a Chocolate bar? A chocolate bar is formed using a mold that can be filled with nuts or fruit or a variety of other items. All of our bars are handmade, hand-wrapped and hand-labeled with no chemical preservatives used in the process. 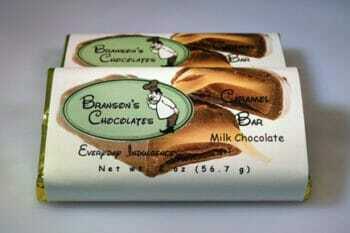 However, we have not always produced Chocolate Bars here at Branson’s Chocolates. Click here to read more about my story of how I made my first chocolate bar. 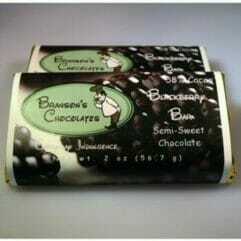 If you enjoy our Chocolate Bars but are looking to try something new, you may also enjoy our Clusters. 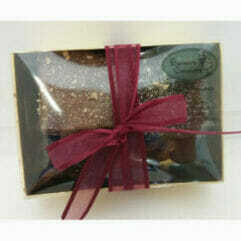 We produce four different types of clusters including Hazelnut, Peanut, Coconut and Raisin Clusters. 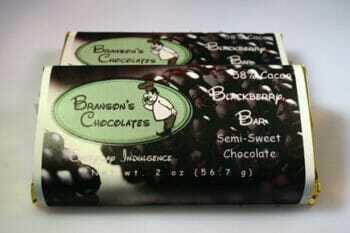 Each individual bar can be purchased for $3.25 with a discount on our six piece box(website only). Many of our bars, along with many of our other products, can be purchased here on our website or in our retail location at 1662 Siskiyou Blvd in Ashland, OR. We have 22 different flavors of Chocolate Bars, and if you find we do not have a flavor you want we offer the option of customizing your ideal bar! 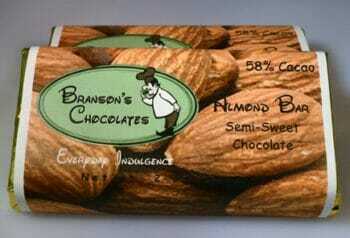 Our Almond Bar contains whole roasted salted almonds in the center of a milk chocolate or semi-sweet 58% (dark) chocolate bar. 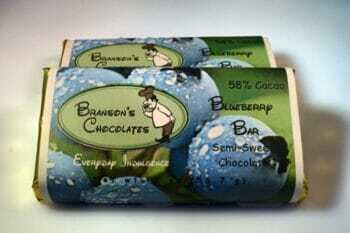 Our Blueberry Bar contains whole soft dried blueberries drenched in layers of semi-sweet 58% (dark) chocolate. Our Blackberry bar is created by cooking a seedless marionberry (Oregon Blackberry) preserve combined with a semi-sweet 58%(dark) chocolate reduction covered in layers of semi-sweet 58% (dark) chocolate. 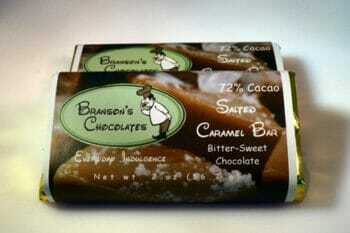 Our Caramel Bar is created by using our soft and chewy caramel covered in milk chocolate. 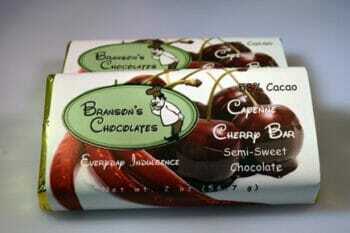 Our Cayenne Cherry Bar uses soft dried cherries in semi-sweet 58% (dark) chocolate that has a cayenne pepper kick. 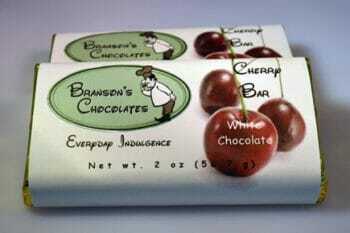 Our Cherry Bar envelops soft dried cherries in white chocolate. 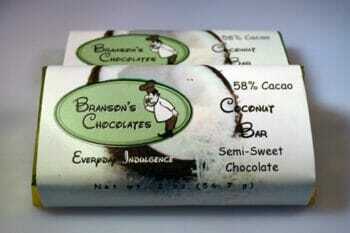 Our Coconut Bar uses our creamy coconut center covered with layers of semi-sweet 58% (dark) chocolate. 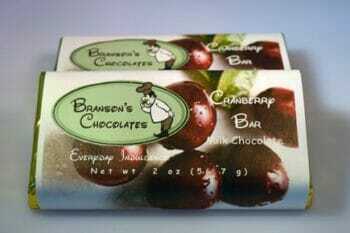 Our Cranberry Bar uses our soft dried cranberries and smothered in milk chocolate. 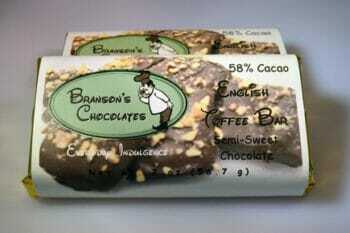 Our English Toffee Bar uses our Old-Fashioned English Toffee and surrounds it with semi-sweet 58% (dark) chocolate. Our Espresso Bar uses locally roasted and finely ground espresso beans gently stirred by hand into either milk chocolate or semi-sweet 58% (dark) chocolate. 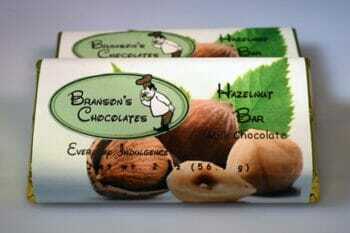 Our Hazelnut Bar uses dry roasted Oregon Hazelnuts with layers of either milk chocolate or semi-sweet 58%(dark) chocolate. 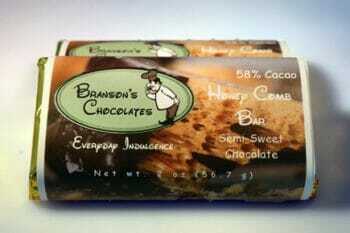 Our Honey Comb Bar use pieces of Honey Comb (toasted expanded sugar) in a semi-sweet 58% (dark) chocolate bar. 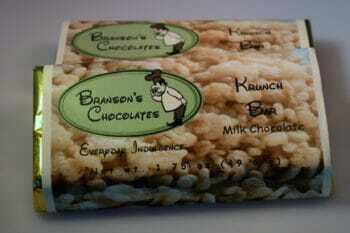 Our Krunch Bar contains gluten-free brown rice Krispies covered in either milk chocolate or semi-sweet 58% (dark) chocolate. 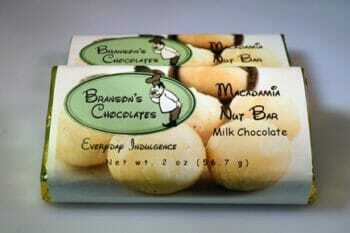 Our Macadamia Nut Bar contains direct from the farmer in Hawaii, chopped macadamia nuts covered in milk chocolate. Our Midnight Bar contains solid bitter-sweet 72% (darkest) chocolate. 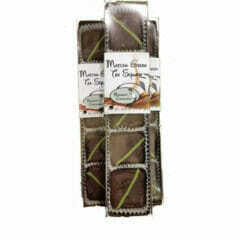 Out Mint Bar contains Seely Family Farms (Clatskanie OR) peppermint oil combined with semi-sweet 58% (dark) chocolate. 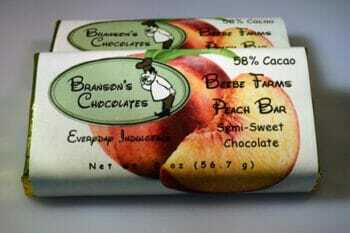 Our Peach Bar contains Beebee Farms (Central Point, OR) peaches, reduced to a preserve and reduced more using white chocolate and covered in dark chocolate. 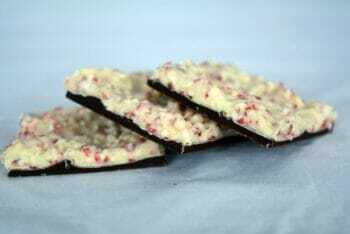 Our Peppermint Bar uses Peppermint candies mixed into White Chocolate with a touch of locally sourced Peppermint Oil. 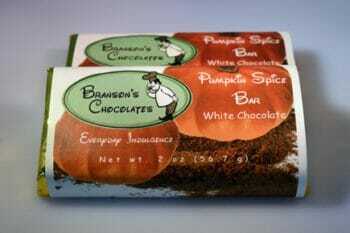 Our Pumpkin Spice Bar uses a house blended pumpkin spice mixed into a white chocolate bar. Our Solid Chocolate Bar comes in milk chocolate, semi-sweet 58% (dark) chocolate, sugar-free milk chocolate or sugar-free semi-sweet 58% (dark) chocolate. Our Salted Caramel Bar uses handmade soft chewy caramel surrounded by Milk Chocolate or Bitter-Sweet 72% (darkest) Chocolate, topped with flakes of sea salt. 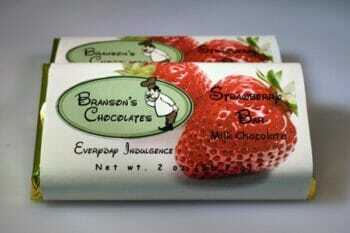 Our Strawberry Bar uses a strawberry preserve and milk chocolate reduction smothered in layers of Milk Chocolate. 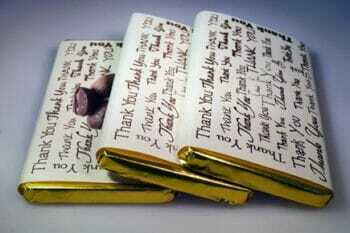 Our Thank-You Bars are engraved with the words “Thank You” into your choice of a milk chocolate espresso, milk chocolate or semi-sweet 58% (dark) chocolate bar. December is the perfect month for peppermint and eggnog, and at Branson’s Chocolates that means Peppermint Bark, Peppermint Bars, and Eggnog Truffles. Our delicious Peppermint Bark is a layer of rich dark chocolate topped with a layer of white chocolate, crushed peppermint candy and a touch of locally sourced peppermint oil. Our scrumptious Peppermint Bars are white chocolate mixed with peppermint candies and a touch of locally sourced peppermint oil. And our smooth and creamy Eggnog Truffles have an eggnog ganache center made with local eggnog, which is dipped in white chocolate, and topped with a sprinkle of nutmeg. Naughty or nice, you deserve some chocolate, so come in and pick up some for yourself. We’re often out and about at many of the local wineries and events. 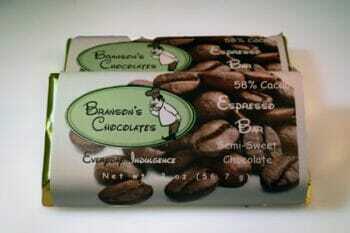 For the latest event updates, please check us out at https://www.facebook.com/bransonschocolates . 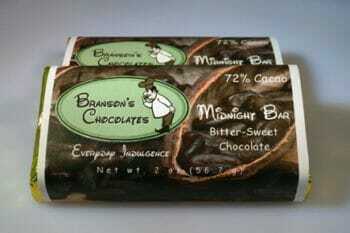 If you’d like to see us at one of your favorite local events, you can contact us on our Facebook page or email us at info@bransonschocolates.com . We’d love to hear from you!